Brazil (the Federative Republic of Brazil) is a country in South America (although also including numerous island archipeligos). It is both the largest (in terms of area), and the only Portuguese-speaking country in that continent. Brazil has land borders with Argentina, Bolivia, Colombia, French Guiana, Guyana, Peru, Suriname, Paraguay, Uruguay, and Venezuela, and also has a long coastline on the Atlantic Ocean. The population of Brazil, as of 2008, was estimated to be around 190 million. The largest city, São Paulo had a population of nearly 11 million, and there are at least 13 other cities with populations of over 1 million. 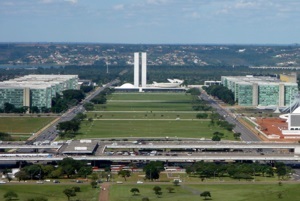 The capital of the country since 1960 is Brasilia which is a purpose built and designed city (planning and development began in 1956). The Brazil economy has been rapidly growing over the last few years, and Brazil is now in the top 10 countries based on both GDP and purchasing power parity. In future years, Brazil is expected to become even more important economically. Explore all Brazil has to offer from idyllic sandy beaches, the lush Amazon rain forest, and the vast Pantanal wetland to colonial Salvador or Modernist Brasília, and the exciting cities of Rio de Janeiro and São Paulo. DK Eyewitness Travel Guide: Brazil is full of inspiring photography and unique illustrations of major attractions such as Sugar Loaf Mountain in Rio de Janeiro, the Iguaçu waterfalls, and the Teatro Amazonas opera house in Manaus. Learn about Brazil's diverse peoples, music, capoeira, Carnaval, and cuisines. Follow tips on samba schools, wildlife-spotting, shopping, getting around, and the best places to eat and stay. With hundreds of full-color photographs, hand-drawn illustrations, and custom maps that illuminate every page, DK Eyewitness Travel Guide: Brazil truly shows you this city as no one else can. Discover this vast and varied South American countrywith the most incisive and entertaining guidebook on the market. Whether youplan to hit the beaches of Rio, take a boat up the Amazon or explore thegorgeous colonial towns of Minas Gerais, The Rough Guide to Brazil willshow you the ideal places to sleep, eat, drink, shop and visit along the way. Independent,trusted reviews written with Rough Guides'trademark blend of humour, honesty and insight, to help you get the most out ofyour visit, with options to suit every budget. Full-colour chaptermaps throughout - to explore Rio's beach neighbourhoods and remote Amazon towns withoutneeding to get online. Stunning images - a rich collectionof inspiring colour photography. Things not to miss - Rough Guides'rundown of the best sights and experiences in Brazil. Detailedcoverage - this travel guide has in-depth practical advicefor every step of the way. 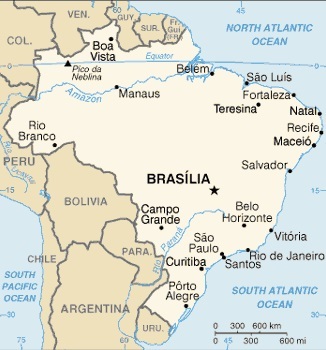 Areas covered include: Rio de Janeiro, São Paulo, Minas Gerais, Espírito Santo, Bahia, theNortheast, the Amazon, Brasília, the Pantanal and the South, covering Paraná,Santa Catarina and Rio Grande do Sul. Attractions include: Rio'sCorcovado, Iguaçu Falls, Salvador's old town, Rio Amazonas boat trips and theIlha do Mel. Basics - essential pre-departure practical information including getting there,local transport, accommodation, food and drink, festivals and events, sportsand outdoor activities and more. Backgroundinformation - a Contexts chapter devoted to history,the environment, music, cinema, football and recommended books, as well as aguide to Brazilian Portuguese. Make the most of your time on Earth with TheRough Guide to Brazil. AboutRough Guides: Escape the everyday with Rough Guides. We are a leading travelpublisher known for our "tell it like it is" attitude, up-to-date content andgreat writing. Since 1982, we've published books covering more than 120destinations around the globe, with an ever-growing series of ebooks, a rangeof beautiful, inspirational reference titles, and an award-winning website. Wepride ourselves on our accurate, honest and informed travel guides. Written by locals, Fodor’s Rio de Janeiro & Sao Paulo is the perfect guidebook for those looking for insider tips to make the most out their visit. Complete with detailed maps and concise descriptions, this travel guide will help you plan your trip with ease. Join Fodor’s in exploring two of the most exciting cities in Brazil. With the FIFA World Cup in 2014 and the Olympic Games in 2016, Rio de Janeiro and São Paulo have experienced rapid change. Rio continues to see an influx of visitors, and this colorful city, along with the equally vibrant metropolis of São Paulo, never disappoint. Whether you want to soak in the sun on Rio's glamorous Copacabana Beach, shop in São Paulo's cutting-edge fashion boutiques, or indulge in Latin American's most innovative cuisine, Fodor’s Rio De Janeiro & São Paulo will ensure that you get the most out of these two exciting cities. •UP-TO-DATE COVERAGE: Fully updated coverage on the best new restaurants, hotels, and sights throughout both cities. Includes expanded coverage on numerous side trips to national parks and resort towns in the surrounding areas, such as the pristine beaches at the ever-popular Buzios. •ULTIMATE EXPERIENCES GUIDE: A spectacular color photo guide captures the ultimate unmissable experiences and attractions throughout Rio de Janeiro and São Paulo to inspire you. •DETAILED MAPS: Full-size street maps throughout will help you plan efficiently and get around confidently. •SPECIAL FEATURES: The Experience chapter has in-depth information on visiting both cities, including the region’s best beaches and insider tips on attending Carnival. •INDISPENSABLE TRIP PLANNING TOOLS: Each chapter opens with an orientation and planning section that includes maps, the top reasons to go, and other essential information to help you plan your time effectively and navigate around. •COVERS: Rio de Janerio, Copacabana, Ipanema, Sugar Loaf Mountain, Buzios, Paraty, São Paulo, Itaim, Jardins, Ilhabela, Embu, São Sebastião. Planning on visiting other places in South America? Check out Fodor’s Essential Argentina, Fodor's Essential Chile, and Fodor's Essential Peru. From the picturesque beaches of Rio de Janeiro to the majestic Iguaçu Falls to the wonders of the Amazon rainforest, Brazil offers something for every type of traveler--and Fodor's Brazil covers the best that the country has to offer. Planning to focus on Rio and Sao Paolo? Check out Fodor's travel guide to Rio de Janeiro & Sao Paulo. Lonely Planet’s Brazil is your passport to the most relevant, up-to-date advice on what to see and skip, and what hidden discoveries await you. Party at Carnaval in Rio, come face to face with monkeys and other creatures in the Amazon, and snorkel the natural aquariums of Bonito – all with your trusted travel companion. Get to the heart of Brazil and begin your journey now! Covers The Amazon, Rio de Janeiro, Sao Paulo, Brasilia, Salvador, Bahia, Pernambuco, Paraiba, Rio Grande de Norte, Parana, Ceara, Piaui, Maranhao, Santa Catarina, Mato Grosso and more. The Perfect Choice: Lonely Planet’s Brazil is our most comprehensive guide to Brazil, and is perfect for discovering both popular and off-the-beaten-path experiences. Looking for more extensive coverage? Check out Lonely Planet’s Rio de Janeiro for an in-depth look at all the city has to offer. Lonely Planet Rio de Janeiro is your passport to the most relevant, up-to-date advice on what to see and skip, and what hidden discoveries await you. Samba the night away in Lapa, people-watch and sip sunset cocktails on Ipanema Beach or get up close to Christ the Redeemer and marvel at the panoramic view of Rio; all with your trusted travel companion. 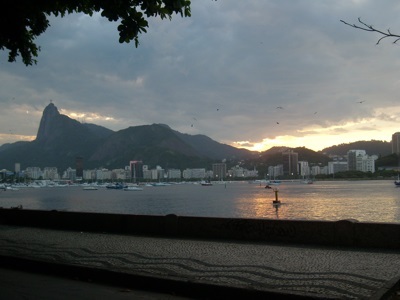 Get to the heart of Rio de Janeiro and begin your journey now! The Perfect Choice: Lonely Planet Rio de Janeiro, our most comprehensive guide to Rio de Janeiro, is perfect for both exploring top sights and taking roads less traveled. Looking for just the highlights? Check out Make My Day Rio de Janeiro, a colorful and uniquely interactive guide that allows you to effortlessly plan your itinerary by flipping, mixing and matching top sights. Looking for more extensive coverage? Check out Lonely Planet Brazil for a comprehensive look at all the region has to offer. Be inspired by the new edition of Insight Guide Brazil, a comprehensive full-color guide to one of the most exciting countries in the world. The awe-inspiring Amazon Rainforest, amazing beaches, and historic towns are only a sample of what Brazil has to offer. Insight Guides' unrivaled coverage of history and culture provides an essential introduction to the 2014 FIFA World Cup and 2016 Olympic Games host nation. Our Best Of Brazil highlights the country’s top attractions, including Sugar Loaf mountain, Salvador’s colonial architecture, the riches of the Amazon, and of course, Carnival! Descriptive region-by-region accounts of where to go are enhanced by beautiful photographs, while all major sights are cross-referenced with full-color maps, and the travel tips section provides a wealth of information on how to plan your trip, plus our selection of the best hotels. Do you want to know where you can swim with enormous fish in crystal clear hidden rivers, without harming the ecosystem? Or how you can safely visit the inner city favelas, and help support the people that live there at the same time? Perhaps you’d like to stay at the most beautiful hotels and guesthouses, while knowing that your choice is benefiting the local community and environment? Welcome to a new type of travel guide. A guide told in stories. Through it, you’ll discover how you can have the adventure of your lifetime. And if you are not traveling right now, don’t worry. The adventures and stories will entertain and encourage you to get planning and start packing! In this book you will hear from some of the most inspiring people that live in Brazil, and what it took for them to bring their dreams to life, for you, and for their country. You'll read about the secret places that not even a local would know. You’ll find stories of eco-tourism and social entrepreneurship from all five regions of this vast country. This book will leave you with the inspiration, tools, and resources to make your journey like no other you have ever experienced. Your author, Richard Brownsdon, is an international award winning travel writer, blogger, and successful entrepreneur. He has travelled to more than 50 countries, runs his company on the move, and loves to share what he learns with his readers. He writes about ecotourism, responsible travel, entrepreneurship, and social enterprise around the world. His work has been translated into several languages, and seen in major travel and international publications, including The Guardian.